Now Open for Reservations: 2020 Seabourn World Cruise! 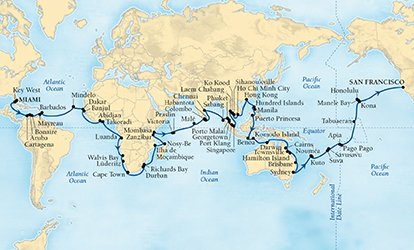 We are excited for Seabourn's first world cruise in quite a while spanning 5 continents over 146 days. This ultra-luxury journey on the intimate, ultra-lux Seabourn Sojourn, will offer you an in-depth experience in 62 ports with 16 overnight stays to further enhance your exploration with optional Seabourn Journeys. Book by May 31, 2019 for a Host of Early Booking Amenities! World Cruise guests will enjoy 16 overnights in port, and linger into the late evening another 18 times, enjoying more than one day exploring a port for every day relaxing at sea. Cross three great oceans, exploring Africa’s coastline from Senegal to the Cape, KwaZulu-Natal and the safari parks of Kenya – and visit undiscovered treasures and UNESCO World Heritage sites from Colombia to Mozambique, the Seychelles to South India, the Philippine Archipelago and Australia’s Queensland Coast to New Caledonia. World Cruisers share long-imagined adventures in congenial company, sumptuous surroundings and superb hospitality, creating a special bond as they become well-traveled in a single voyage. Jan. 4 Sat. Miami, Florida 6:00p.m. Jan. 5 Sun. Key West, Florida 7:00a.m. 4:00p.m. Jan. 9 Thurs. Cartagena, Colombia 8:00a.m. 6:00p.m. Jan. 11 Sat. Oranjestad, Aruba 8:00a.m. 11:00p.m. Jan. 12 Sun. Kralendijk, Bonaire 9:00a.m. 11:00p.m. Jan. 14 Tues. Saline Bay, Mayreau 8:00a.m. 5:00p.m. Jan. 15 Wed. Bridgetown, Barbados 7:00a.m. Jan. 16 Thurs. Bridgetown, Barbados 5:00p.m. Jan. 22 Wed. Mindelo, Cape Verde 8:00a.m. 8:00p.m. Jan. 24 Fri. Dakar, Senegal 7:00a.m. Jan. 25 Sat. Dakar, Senegal 11:00p.m. Jan. 26 Sun. Banjul, Gambia 6:00p.m. 6:00p.m. Jan. 30 Thurs. Abidjan, Ivory Coast 8:00a.m. 6:00p.m. Jan. 31 Fri. Takoradi, Ghana 8:00a.m. 6:00p.m. Feb. 4 Tues. Luanda, Angola 8:00a.m. 6:00p.m. Feb. 7 Fri. Walvis Bay, Namibia 8:00a.m. Feb. 8 Sat. Walvis Bay, Namibia 2:00p.m. Feb. 9 Sun. Luderitz, Namibia 9:00a.m. 6:00p.m. Feb. 11 Tues. Cape Town, South Africa 7:00a.m. Feb. 12 Wed. Cape Town, South Africa 11:00p.m. Feb. 15 Sat. Durban, South Africa 8:00a.m. 10:00p.m. Feb. 16 Sun. Richards Bay, South Africa 7:00a.m. 5:00p.m. Feb. 19 Wed. Ilha De Moçambique, Mozambique 10:00a.m. 6:00p.m. Feb. 21 Fri. Andoany (Hell-Ville), Madagascar 8:00a.m. 5:00p.m. Feb. 24 Mon. Zanzibar, Tanzania 8:00a.m. 6:00p.m. Feb. 25 Tues. Mombasa, Kenya 6:00a.m. Feb. 27 Thurs. Mombasa, Kenya 11:00p.m. Mar. 1 Sun. Victoria, Mahé, Seychelles 8:00a.m. 11:00p.m. Mar. 2 Mon. Praslin, Seychelles 8:00a.m. 5:00p.m. Mar. 6 Fri. Malé, Maldives 8:00a.m. 8:00p.m. Mar. 8 Sun. Colombo, Sri Lanka 7:00a.m. 6:00p.m. Mar. 9 Mon. Hambantota, Sri Lanka 7:00a.m. 6:00p.m. Mar. 11 Wed. Chennai (Madras), India 7:00a.m. Mar. 12 Thurs. Chennai (Madras), India 11:00p.m. Mar. 16 Mon. Sabang, Pulau Weh, Indonesia 7:00a.m. 3:00p.m. Mar. 17 Tues. Phuket, Thailand 8:00a.m. 11:00p.m. Mar. 18 Wed. Porto Malai, Langkawi, Malaysia 10:00a.m. 8:00p.m. Mar. 19 Thurs. Georgetown, Penang, Malaysia 7:00a.m. 4:00p.m. Mar. 20 Fri. Port Klang (Kuala Lumpur), Malaysia 8:00a.m. 6:00p.m. Mar. 22 Sun. Singapore, Singapore 6:00p.m. Mar. 25 Wed. Laem Chabang (Bangkok), Thailand 8:00a.m. 6:00p.m. Mar. 26 Thurs. Ko Kood, Thailand 7:00a.m. 5:00p.m. Mar. 27 Fri. Sihanoukville (Kâmpóng Saôm), Cambodia 7:00a.m. 8:00a.m. Mar. 29 Sun. Ho Chi Minh City (Saigon), Vietnam 9:00a.m. Mar. 30 Mon. Ho Chi Minh City (Saigon), Vietnam 4:00p.m. Apr. 2 Thurs. Hong Kong 8:00a.m. Apr. 3 Fri. Hong Kong 6:00p.m. Apr. 5 Sun. Hundred Islands, Philippines 7:00a.m. 3:00p.m. Apr. 6 Mon. Manila, Philippines 8:00a.m. 11:00p.m. Apr. 8 Wed. Puerto Princesa, Philippines 8:00a.m. 6:00p.m. Apr. 12 Sun. Benoa (Denpasar), Bali, Indonesia 8:00a.m. Apr. 13 Mon. Benoa (Denpasar), Bali, Indonesia 2:00p.m. Apr. 14 Tues. Slawi Bay, Komodo, Indonesia 10:00a.m. 6:00p.m. Apr. 17 Fri. Darwin, Northern Territory, Australia 7:00a.m. 6:00p.m. Apr. 22 Wed. Cairns, Queensland, Australia 6:00p.m. Apr. 23 Thurs. Townsville, Queensland, Australia 8:00a.m. 6:00p.m. Apr. 24 Fri. Hamilton Island, Queensland, Australia 8:00a.m. 5:00p.m. Apr. 26 Sun. Brisbane, Queensland, Australia 8:00a.m. 6:00p.m. Apr. 28 Tues. Sydney, New South Wales, Australia 8:00a.m. Apr. 29 Wed. Sydney, New South Wales, Australia 11:00p.m. May 3 Sun. Nouméa, Grande Terre, New Caledonia 8:00a.m. 11:00p.m. May 4 Mon. Kuto, Île Des Pins, New Caledonia 8:00a.m. 5:00p.m. May 7 Thurs. Suva, Vitu Levu, Fiji 8:00a.m. May 8 Fri. Suva, Vitu Levu, Fiji 6:00p.m. May 9 Sat. Savusavu, Vanua Levu, Fiji 8:00a.m. 5:00p.m. May 11 Mon. Apia, Upolu, Samoa 10:00a.m. 8:00p.m. May 11 Mon. Pago Pago, Tutuila, American Samoa 7:00a.m. 5:00p.m. May 16 Sat. Tabuaeran (Fanning Island), Kiribati 8:00a.m. 4:00p.m. May 18 Mon. Kona, Hawaii, HI 10:00a.m. 8:00p.m. May 19 Tues. Honolulu, Oahu, HI 8:00a.m. May 20 Wed. Honolulu, Oahu, HI 11:00p.m. May 21 Thurs. Manele Bay, Lanai, HI 8:00a.m. 5:00p.m. May 28 Thurs. San Francisco, CA 7:00a.m. *All fares are in U.S. dollars, cruise-only, for new bookings only, per guest, double occupancy, and subject to availability. Taxes, Fees and Port Expenses are included for the 146-day Full World Cruise. Standard pricing terms apply, in addition: Full World Cruise Amenities apply to World Cruise Guests only on the full 146-day World Cruise. Air Offer: Complimentary World Cruise Air available for a limited time, for guests purchasing the full 146-day World Cruise (all segments) will receive First Class Air. All Air Packages are: (1) valid for full fare cruise guests booking/purchasing the applicable Air Package for round-trip travel via Seabourn’s Flight Ease program, (2) capacity controlled and subject to availability, (3) applicable to first and second full-fare guests per suite only, (4) limited to specific U.S. gateways, (5) and include one complimentary checked bag, additional fees for baggage and other charges may be directly assessed by airlines or airports; please refer to the applicable airline website for further information. Shipboard Credit Offer: World Cruise Shipboard Credit of $4,000USD per suite ($2,000USD/person) for guests booked in Ocean-view and Veranda suites; World Cruise Premium Suite Shipboard Credit of $6,000USD per suite ($3,000USD/person) for guests booked in PH, PS, OW, SS, WG and GR suite categories only. All shipboard credit offers are in U.S. dollars and are non-refundable, non-transferable, not for cash value, expires at the end of the cruise, may not be used in the casino and are not combinable with any other shipboard credit offer. Unlimited Internet Package: Complimentary World Cruise Unlimited Internet Package includes (1) unlimited internet package per suite (guests booked in OW, SS, WG and GR includes (2) unlimited internet packages per suite). Internet service is not guaranteed. Seabourn is not responsible if Internet service is unavailable. No credit or other compensation will be provided should Internet service not be available. Transfers: Complimentary World Cruise transfers are provided to guests using Seabourn’s Flight Ease program only. This includes round-trip transfers between home and airport, airport and hotel, hotel and ship. Round-trip transfers between home and airport are limited to 100 miles. Luggage: Complimentary World Cruise Personal Valet Door-to-Door Luggage Service applies to guests residing in the U.S., Canada, United Kingdom, Europe and Australia only on the 146-day World Cruise. Luggage is restricted to 2 bags per guest at 50lbs per bag. Certain restrictions apply. Visa Package: Complimentary World Cruise Visa package apply to U.S. and Canadian citizens only. “PAY IN FULL” Offer: Pay in full by May 31, 2019 and save an additional 3 percent from the gross cruise-only fare after discount, not tariff. Applicable to Full World Cruise and World Cruise Segment guests, including third and fourth persons. Agent commission is based on discounted fare after all discounts are applied. Ships’ registry: Bahamas. ©2018 Seabourn.